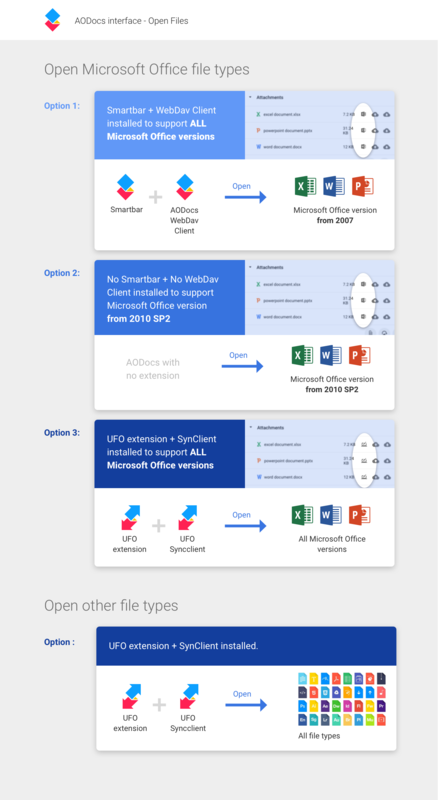 With the AODocs Smartbar installed, you can open and edit Microsoft Office files (Word, Excel and Powerpoint) directly in Google Drive, without having to download, modify and re-upload them in Google Drive. In addition, if UFO is also installed, you can use it with the Smartbar and open and edit any non-Google files from the Google Drive interface directly on your computer. 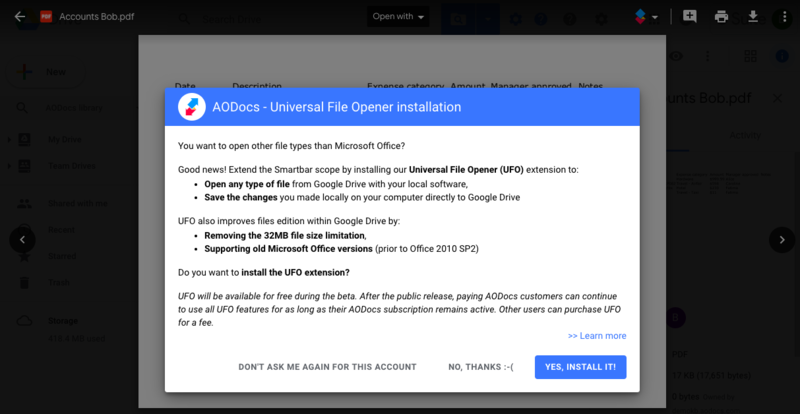 Read more about the AODocs Smartbar and opening and editing non-Google files with UFO. This article explains how to edit non-Google files from Google Drive directly on your computer. It also presents a summary of the options available for opening non-Google files in AODocs and in Google Drive. Below is a summary of the options available for opening non-Google files in AODocs and in Google Drive. 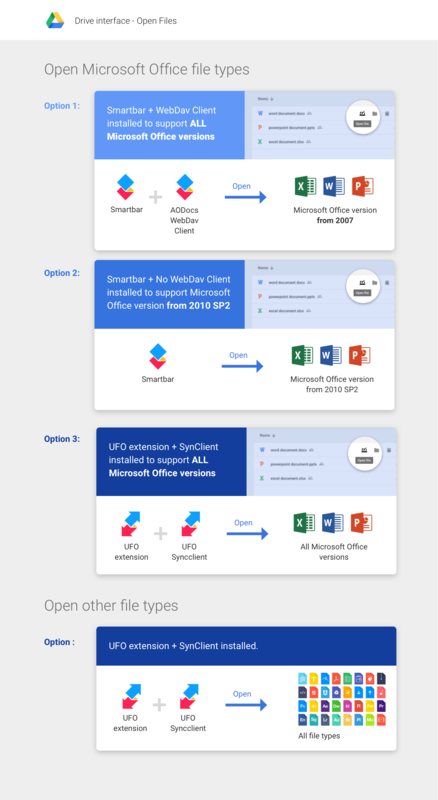 You can edit Microsoft Office files with the Smartbar installed and activated even if UFO is not installed. 1. Press the Open file button displayed next to your Microsoft Office file. The Open file button appears when you hover the cursor over a Microsoft Office file. Tip: You can open files in Microsoft Office that are not managed by AODocs, for example files from your My Drive folders or files from your Team Drives. Alternatively, open your Microsoft file in the Google file preview and select Open file in the Smartbar menu. Learn more: Access Smartbar features in the Google Drive file preview. 2. The AODocs Smartbar opens the file in the dedicated Microsoft Office application, for example Excel. Microsoft Office downloads the file from AODocs. 3. Edit your Microsoft Office file directly in the dedicated application. 4. Save and close your file. Your changes are saved and your file is uploaded to Google Drive. Note: In Microsoft Office, files managed by AODocs may open automatically in Protected View because they are downloaded from the internet. To edit the file, accept the prompt that appears when you open it. To change this default behavior, change the setting of the Protected View in Microsoft Office. Read more about how to change your Protected View settings. You have to install the Universal File Opener extension to be able to use it with the Smartbar. Note: The Universal File Opener (UFO) is in public beta and will be available for free during this period. After the public release, it will be available to paying AODocs customers who pay list price as long as their AODocs subscription remains active. Other users can purchase UFO for a fee. UFO in Smartbar allows you to open and edit non-Google files of any size from the Google Drive interface directly on your computer. 1. Press the Open file button. Note: If UFO isn’t installed, you will still see the Open file button on all non-Google files. Alternatively, open your non-Google file in the Google file preview and select Open file in the Smartbar menu. Learn more: Access Smartbar features in the Google Drive file preview. 2. A prompt containing instructions to install UFO is displayed. Read more about opening and editing non-Google files in UFO.